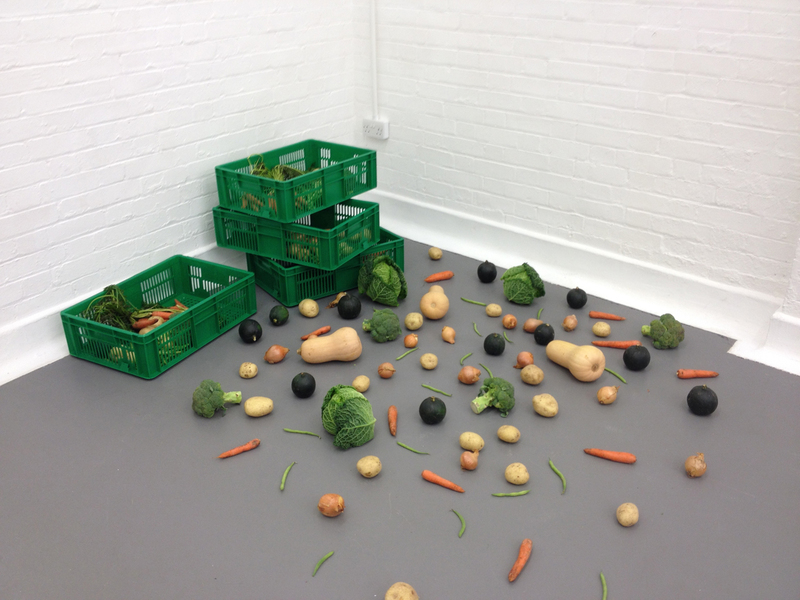 LONDON — When you enter the first room of Nina Beier’s solo exhibition at David Roberts Art Foundation (DRAF), you encounter “Scheme” (2014), an enigmatic stack of green crates with vegetables scattered on the floor. The Danish-born, Berlin-based artist has signed the foundation up for a weekly vegetable box service. Each week, the discarded crates are added to the heap. This configuration of vegetables isn’t Beier’s strongest work: the concept of using art to give form to the passage of time is tired, and the mass of broccoli, squash, and carrots ends up as not much more than a nice-looking installation in a corner. Even so, it helps create a relationship with another nearby scattering of objects: an installation by Beier and Simon Dybbroe Møller that features copies of Auguste Rodin’s hands studies. The artists have reproduced them in various sizes and materials, painting the hands to resemble human skin. The title of the work, “Industrial Revolution” (2013), in play with its content, evokes the transformation of production systems that happened in the second half of the 18th century, with a clear emphasis on reproduction. The most noteworthy work in the show, however, is the one underneath “Industrial Revolution.” “Tileables” (2014) is a 125-square-meter, site-specific floor mosaic made of ceramic tiles and a kind of encapsulation of Beier’s artistic outlook. 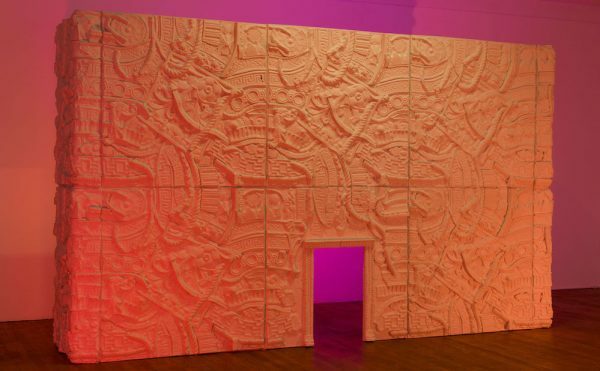 For the piece, she decided to digitally print different patterns imitating materials such as skin, concrete, and peeling wood on different sets of tiles. 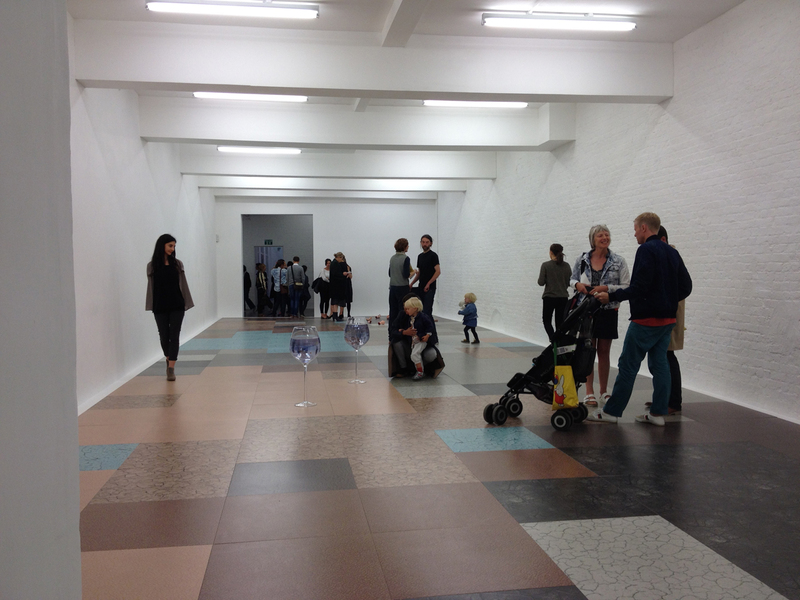 Visitors must walk on the work if they want to reach the other rooms of the show, which makes for a slightly odd but ultimately enjoyable effect. “Tileables” sums up many of Beier’s key themes — fragmentation, dispersion, and dissimulation, all of which can also be detected in the other pieces in the show. Overall, the DRAF exhibition borrows its aesthetic from Minimalist and Postminimalist practices; the accumulation and scattering of objects on the floor particularly are devices employed in the past by artists such as Robert Morris and Barry Le Va. Beier revisits these display schemes through the filter of postmodern culture, taking up ideas of copying and reproduction. “Tileables” is a good example: its presentation recalls the floor works of Carl Andre, but its concept connects the piece to the tenuous relationship between object and image, and in this case also the question of the physical vs the digital. 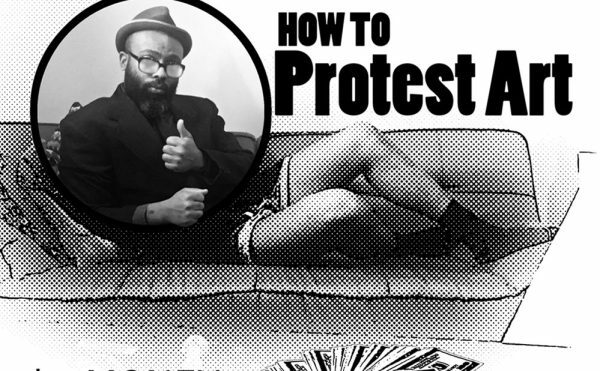 Sometimes, however, Beier gets carried away with presentation. 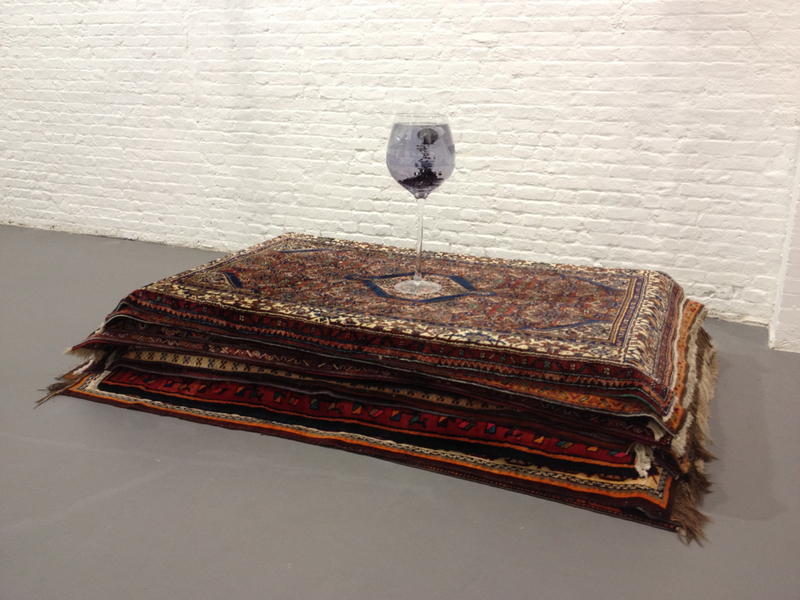 “Stand” (2014) is a compelling work comprising three variously sized stacks of hand-knotted Persian carpets. 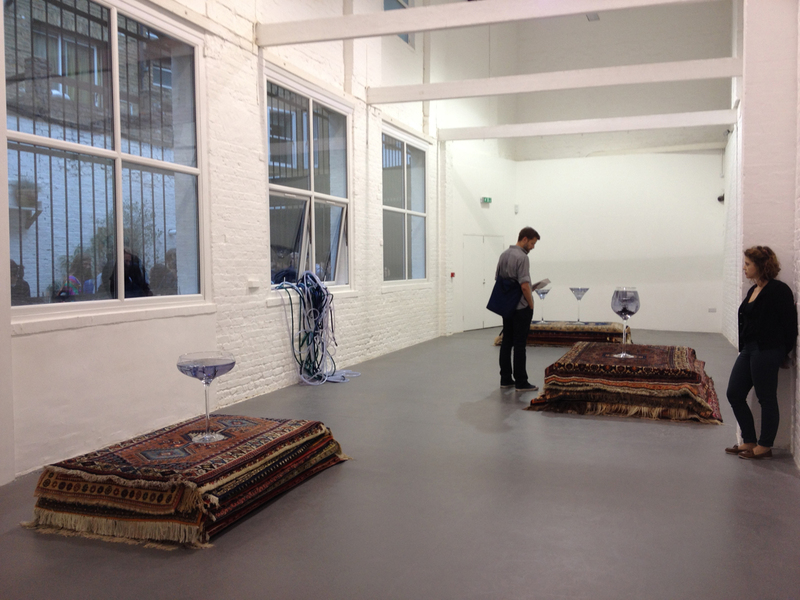 The rugs, made of a warm material such as wool, make for a fascinating contrast with the white-cube environment of the room; unfortunately, this is thwarted by some oversize resin glasses, which are part of a larger series of works entitled “Plunge” (2014). Placed on the rug stacks, the glasses are an irritating presence that doesn’t seem to connect with “Stand,” instead disrupting its power. With a few notable exceptions, Beier’s DRAF exhibition fails to draw the visitor in. It’s difficult to say whether this stems from the ambiguity of some of the work or from the artist’s chosen themes, for instance her insistence on fragmentation. But the distance between Beier’s works and the public can feel at times too big to overcome. Her leitmotifs are ambitious and difficult to shape, and the artist deserves credit for facing that challenge. At the same time it’s quite easy to spot when the execution of a piece doesn’t quite meet its concept. I left the show with the sensation of having seen some cool stuff, but also the feeling that it may have been too cool, in the end. 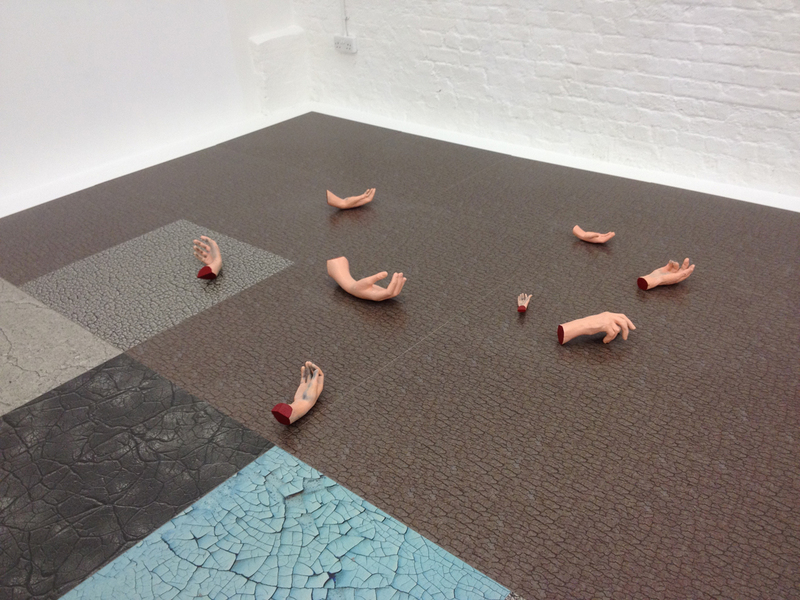 Nina Beier continues at the David Roberts Art Foundation (Symes Mews, London) through December 13.